Not the best solution for your biggest and most expensive filters. Pros: The price is OK and the pouch does what it is supposed to do with an OK padding for the two filter pockets. Cons: It is a tiny bit too small for 77mm filters, you can get them in, but you have to use a little bit of force. Not what you want to do with expensive filters. 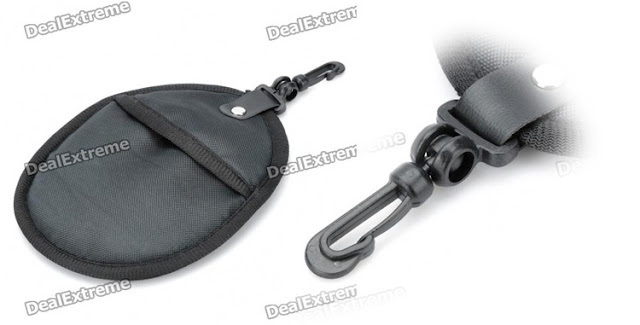 The carabiner clasp is plastic and the ball joint that connects it to the pouch feels cheap an unreliable. Again, not something you would like to put your most expensive filters in if you're going to hang the pouch on the outside of your jacket, bag, on your belt or whatever. Works best with filters smaller than 77mm and/or as a bag you carry inside a pocket or something like that.